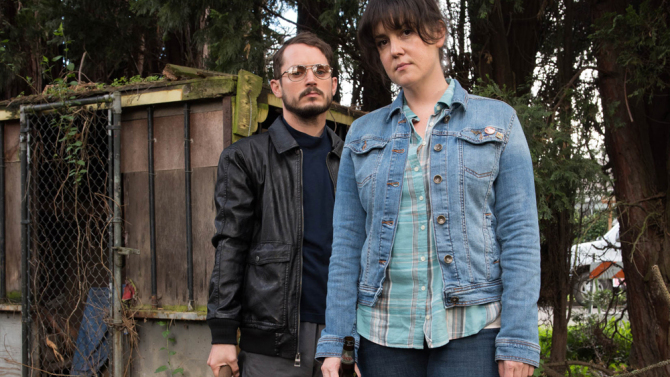 The opening shot of Macon Blair’s Netflix original “I Don’t Feel at Home in This World Anymore” succinctly encapsulates that title. Ruth Kimke (Melanie Lynskey), a lonely nursing assistant, steps into her backyard under the cover of night. As she stands there, the white noise of people mingling at a party, perhaps next door, perhaps a few doors down, encroaches ever so subtly on the soundtrack, not overwhelming it which is precisely what makes it overwhelming, like somewhere else there is always something happening of which she is not part. She looks to the sky as the camera cuts to an overhead shot, pulling back, as if mirroring her fervent wish to simply break these surly bonds of earth. That desire for escape is illustrated in the ensuing series of blood pressure raising comic encounters with a variety of strangers at various locations in which their indifferent attitude toward humanity leaves her reaching for Coors Lights in the refrigerator. Throughout these scenes, and throughout the film, Lynskey does a fine job evincing the struggle of keeping it together in the face of how the whole world seems to be a mountain made of unrelenting mole hills. The obligatory last straw comes when her house is robbed. Gone is her laptop, her grandmother’s priceless silver and prescription medication, latter of which is apparently for depression, a plot point raised but hardly seen through. Ruth’s forthcoming spiral might well be driven by being off this medication but no real indication is given, and whether or not the conclusion is a product of still being off it or having got back on it also remains nebulous. The screenplay, written by Blair, is more interested in the crime itself, which the police can hardly be bothered to investigate. So Ruth enlists the aid of Tony (Elijah Wood), her heavy-metal loving Christian neighbor who carries nunchucks, and pursues the criminals herself. What transpires becomes something like the lived out rage of “Falling Down” filtered through that episode where an out-of-their-element Sweet Dee and Mac of “It’s Always Sunny In Philadelphia” become bananas versions of Guardian Angels. That journey brings Ruth and Tony into contact with the responsible thief, Christian (Devin Graye), and his two counterparts. Blair unfortunately fails to give much thought to the characters surrounding Ruth, turning Tony into a jumble of attributes that never quite pulls together into a real person and not really defining who this trio of robbers is and why they have united. Their ultimate plan apparently involves an armed robbery of Christian’s father Chris (Robert Longstreet), who we meet when Ruth and Tony uncover his identity and pay him a visit. Though Christine Woods provides a deft cameo as the Chris’s new wife, so lonely and unhappy she invites Ruth and Tony in for someone simply to talk to, speaking like a person who surrendered to her vacuous lot in life a long time ago, the scene paints Christian as a son who turned his back on the opportunities presented by such a cushy life which led him to off the rails. And this, I am afraid to report, another tale of woe of a spoiled rich kid is what passes for an argument for the fall of humanity that has sent Ruth over the edge. It is less than convincing, a narrative fail safe where something more searing and sharp was needed. That’s a problem because Ruth’s entire quest is not about Getting What’s Hers but confronting what society has become. Yet with such little thought paid to where society has fallen down on its supposed obligations, the confrontation consequently rings hollow. And as if knowing he doesn’t quite know where to take Ruth and Tony once the story gets ramped up, Blair eventually plunges the dark comedy into darkly comic violence and then jettisons the comedy altogether for nothing but violence, suitably grotesque, I suppose, but so what? In the end, Ruth gets what’s hers, but you are left thinking that the next time something goes wrong what she got this time around still will not be anywhere near enough.